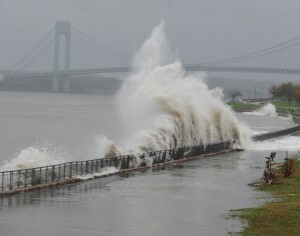 This is a "perfect storm," the likes of which haven't been seen in NYC... ever. Hurricane Irene was a toy compared to this one. If the Western-generated snow front collides with the rain and wind from the south, we're in for a biggie here in the New York-New Jersey area. If you've been advised to evacuate, it is probably already too late. What you must do, at this point, is stay away from your windows, keep tuned to the radio or TV, and hope. There are restaurants open in some areas, but we aren't advising that you venture outside unless you really need to. "Could the storm cause window breaking or building collapse in N.Y.C. — especially for the high buildings — due to high winds? Is there something people should do to minimize risk of injury while either staying home or walking in the streets? Wind gusts from Hurricane Sandy, according to the National Weather Service, are expected to reach 80 miles per hour in the New York City area on Monday night, and up to 60 to 70 miles per hour Monday afternoon. Wind at that speed does present a danger to pedestrians and others out on the streets, due mostly to the risk posed by flying debris. It is for that reason that Mayor Michael R. Bloomberg, in his news briefing on Monday morning, asked New Yorkers to stay home if possible. Apartment windows in high-rises are designed to withstand winds upward of the strength we will see in this storm. Therefore, most residents should not face a problem with their windows breaking. However, people who live on upper floors of high-rises, generally considered over the 10th floor, were urged by the mayor to close their window shades and stay away from their windows as much as possible. That’s because wind speeds are amplified at higher altitudes. A pamphlet (pdf) issued by the city on hurricane preparedness contains more tips, including making sure that items on balconies are secured and residents should relocate to a lower floor if possible during the worst conditions." This entry was posted on Monday, October 29th, 2012 at 4:13 pm	and is filed under Stuff to Do. You can follow any responses to this entry through the RSS 2.0 feed. You can leave a response, or trackback from your own site.